Like many children who grew up in the 90s, I watched Boy Meets World. I don’t know if I’ve seen every episode or not, but I’ve seen a lot of it, some episodes multiple times. I enjoyed the show (obviously, since I watched it), but it was never a favorite. When I heard about Girl Meets World I thought it sounded cute but I never made the effort to watch it. But a while back Annie posted about her love for the show and I knew that when I got Netflix one day I would have to check it out. If you recall, the first thing I did when I did when I got Netflix was binge Anne With an E, but after that I started Girl Meets World. I’ll admit, I was skeptical after the first couple of episodes. The characters start out in junior high school and it felt so incredibly young, and there was just a lot of silliness I didn’t “get” at first, like “Farkle Time.” But I stuck with it and it didn’t take too long for me to fall in love with the characters and appreciate the stories and lessons in the show. In fact, I really wish there were more movies/TV shows/books with the innocence and fun of Girl Meets World. So unfortunately much of seasons two and three were riddled with an unfortunate love triangle with Riley-Lucas-Maya that frustrated me, but season one had some super great moments where while it was clear that Lucas and Riley liked each other, they weren’t rushing into a romantic relationship and were content with friendship. Considering they were in seventh grade, this was really a smart thing and it’s not encouraged enough in media, which often tells kids and teens to act on their feelings, irregardless of what the consequences may be (I know I sound 100 years old but it’s true). And thankfully it did resolve in a very satisfying way in season three. Lucas: Back here in the seventh grade, I think we’d have more fun just hanging out together. Lucas: I just can’t believe that little guy stole my moment… again. Riley: You thought that was your moment? In “Girl Meets New World,” Riley and Lucas decide to do things in their own timing instead of everyone else’s – and he asks Cory’s permission to date Riley. At the end of the episode, it’s clear they’re not ready for a relationship yet, but instead of this being a setback, it really helps their friendship thrive as they continue to mature (well, except maybe the whole love triangle thing!). Lucas: My favorite thing in this world is when you talk to me. Lucas: It’s OK for you to talk to whoever you want to, Riley… But the important talks, the ones that we’re going to think about and always remember… can those be just between you and me? Riley: Well, I don’t know, Lucas. How could that happen? Lucas: Well I was thinking that if we were together a little more, that you would only talk to other people a little bit and you would talk to me a lot. Riley: That’s what you were thinking? Riley: So if there was some dance or something, maybe we could go together? Lucas: Yeah, without even asking each other. Riley: And if you went out and got a sandwich or something, maybe you would think to get me one too? Lucas: And a drink. And cake. So you’ve been thinking about this too? Riley: Yeah. Yeah, I think about it all the time. I always said that the most important thing is that nobody got hurt. Will Maya be OK? Lucas: She’s the one who sent me to you. Riley: So this is our moment. Lucas: I promised you that my moment would be my moment. This is it… I choose you, and I really want you to choose me. Riley: I do. I always did. 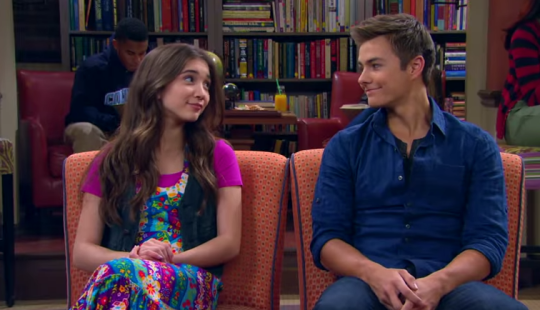 In “Girl Meets Ski Lodge: Part Two,” there’s also resolution between Maya and Josh. Josh tells Maya that while he might be older than her, he knows a loyal companion when he sees one (“maybe it’s because your dad left, but you have the greatest capacity for love that I’ve ever seen”), and he’s willing to play the long game with her. 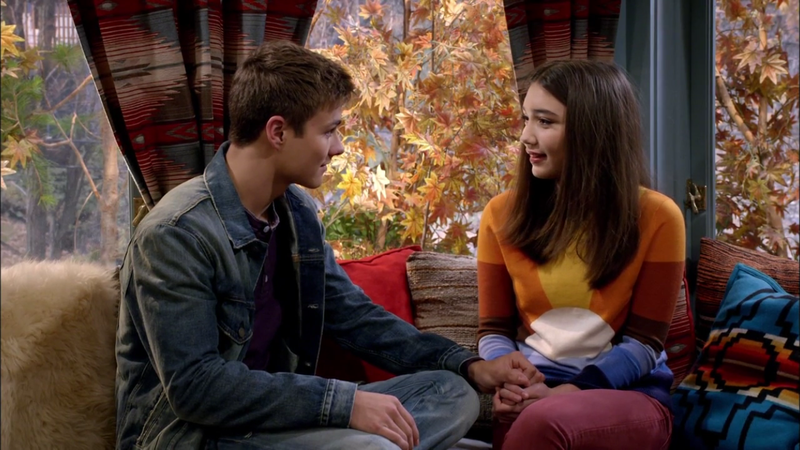 At the end of the episode Riley and Maya talk, and Riley asks Maya, “So, you and Josh?” and Maya responds, “Someday. Who knows?” The episode ends a conversation between them that makes it clear that despite how they feel about the guys in their lives, their friendship with each other is still what matters most to them, which at that age, before their respective relationships are going to be anywhere near marriage, is exactly as it should be. Later, in “Girl Meets Bear,” Zay tells Josh he thinks his and Maya’s long game plan is “sophisticated,” but he has a proposal for Maya. He tells her, “You helped me not feel like an outsider… I never want you to feel like a third wheel when Lucas and Riley are gazing into each other’s stupid, stupid eyes. I want you to know that I would be happy to sit next to you, next to Riley and Lucas, at the movies, so that we can all be together.” He turns to Josh, “Is that alright with you? I don’t care. Is that alright with you?” Josh: I think that’s up to Maya. (He looks at her) Till next time? Maya: Till next time. Again, I like the emphasis here that is placed on the friendships first and foremost. Zay doesn’t have a romantic interest in Maya, but he cares for her deeply and doesn’t want her to miss out on fun times they can have as a group because she’s waiting for Josh. As I said before, the whole show is really about the value of friendships in our lives. Healthy, thriving friendships. Even when they disagree, Riley and Maya always work things out. No matter what’s happening in their lives, they get through every bump in the road with each other and their other friends. I absolutely loved that. If you’ve seen Girl Meets World, tell me what you love about it! I said it once, I’ll say it again. I ADORE Girl Meets World. What a great show! It’s so fun! I’m so glad watched it! It’s so funny – I was randomly rewatching Girl Meets World tonight and (finally!) browsing through blogs and I found this post. It’s like it’s meant to be 😉 I love how you delved into your favorite moments!!! I totally agree, in the beginning it was a little too young and silly for me too. But you just get so into the characters and they all grow up so well that it’s fun to go through it with them. I also really, really love Lucas and Farkle’s friendship. It’s, on the surface, unexpected but so sweet and fun and (I think) one of the quiet hearts of the show.